Oral herpes is an infection of the mouth and lips caused by the herpes simplex virus (also termed HSV). The virus causes painful sores on lips, gums, tongue, roof of the mouth, and inside the cheeks and sometimes on the face and neck. It also can cause symptoms such as fever and muscle aches. People commonly refer to the infection as “cold sores.” Another condition, “canker sore,” is often thought to be caused by HSV, but this is not true. Canker sores occur only inside the mouth, on the tongue and on the soft palate (roof of mouth), not on skin surfaces. Although they reoccur, they are not contagious, usually are self-limiting, and have almost no complications. Canker sores are caused by substances that irritate the oral mucosa. There are two types of HSV, termed HSV-1 and HSV-2. These two viruses have distinctly different DNA, and both cause oral and genital lesions. However, HSV-1 causes about 80% of all oral lesions and only about 20% of genital lesions while HSV-2 causes the reverse (80% genital and 20% oral). Studies also suggests that in adolescents, up to 40% of genital herpes is caused by HSV-1 because of reported increased oral/genital contact. 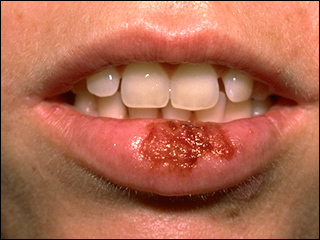 Oral herpes (HSV-1) infection (or exposure without noticeable infection) is common. About 65% of the U.S. population have detectable antibodies to HSV-1 by age 40. This article will focus on HSV-1, commonly termed oral herpes, not on HSV-2, commonly known as genital herpes. HSV-1 affects only humans. Mouth sores most commonly occur in children 1-2 years of age, but they can affect people at any age and any time of the year (also termed herpes gingivostomatitis). People contract HSV-1 by touching infected saliva, mucous membranes, or skin. Because the virus is highly contagious, a majority of the population are infected by at least one herpes subtype of HSV-1 before adulthood. After HSV-1 infects a person, it has a rather unique ability to proceed through three stages. Stage 1 – Primary infection: The virus enters the skin or mucous membrane, usually through small cracks or breaks, and then reproduces. During this stage, oral sores and other symptoms, such as fever, may develop. The virus may not cause any sores and symptoms. You may not know that you have it. This is called asymptomatic infection. Stage 2 – Latency: From the infected site, the virus moves to a mass of nerve tissue in the spine called the dorsal root ganglion. There the virus reproduces again, usually without any symptoms, and becomes inactive, until reactivated by certain body conditions. Stage 3 – Recurrence: When people encounter certain stresses, emotional or physical, the virus may reactivate and cause new sores and symptoms. Investigators have suggested the following factors may contribute to recurrence: stress, ultraviolet light (including sunshine), fever, fatigue, hormonal changes (for example, menstruation), immune depression, and trauma to a site or a nerve region where previous HSV infection occurred. Herpes simplex virus (HSV) is a DNA virus that causes sores in and around the mouth. Two herpes subtypes may cause these sores. These viruses enter the body through small cuts, abrasions, or breaks in the skin or mucous membranes. The majority enter after an uninfected person has direct contact with someone carrying the virus (either with or without noticeable lesions). Simply touching an infected person is often the way children get exposed. Adolescents and adults frequently get exposed by skin contact also but may get their first exposure by kissing or sexual contact, especially for HSV-2. Oral lesions (and genital lesions) can reoccur. This happens because the HSV viruses are still alive but exist in a dormant, or quiet state, in nerve cells. 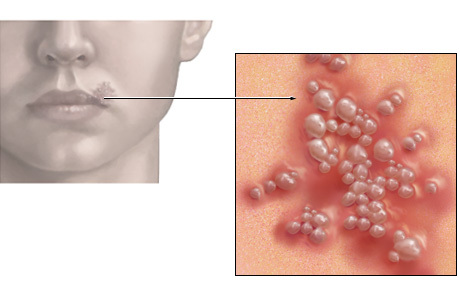 Occasionally, conditions in the body (see Stage 3 above) allow the HSV to actively multiply, resulting in a new crop of lesions. The HSV viruses multiply in the human cells by utilizing most of the human cells functions; one of the HSV steps in multiplication is to take over the human cell’s nucleus and alter its structure. The altered nucleus (enlarged and lobulated or multinucleated) is what is used to help diagnose HSV infections by microscopic examination. The reason sores appear is because as they mature the many HSV particles rupture the human cell’s membrane as they break out of the cell. Incubation period: For HSV-1, the amount of time between contact with the virus and the appearance of symptoms, the incubation period, is two to 12 days. Most people average about four days. Duration of illness: Signs and symptoms will last two to three weeks. Fever,tiredness, muscle aches, and irritability may occur. Pain, burning, tingling, or itching occurs at the infection site before the sores appear. Many patients have reported these symptoms prior to the appearance of sores or blisters. Then clusters of blisters erupt. These blisters break down rapidly and, when seen, appear as tiny, shallow, gray ulcers on a red base. A few days later, they become crusted or scabbed and appear drier and more yellow. Oral sores: The most intense pain caused by these sores occurs at the onset and may make eating and drinking difficult. The sores may occur on the lips, gums, throat, the front of the tongue, the inside of the cheeks, and the roof of the mouth. They may also extend down the chin and neck. The gums may become mildly swollen, red-colored, and may bleed. Neck lymph nodes often swell and become painful. People in their teens and 20s may develop a painful throat with shallow ulcers and a grayish coating on the tonsils. This entry was posted in Uncategorized and tagged asymptomatic infection, canker sores, cold sores, dorsal root ganglion, genital lesions, herpes gingivostomatitis, herpes simplex virus, latency, mouth sores, oral herpes on December 5, 2011 by chzechze.